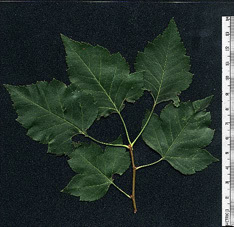 Leaves are alternate, simple, with thorns or spines. There are several hundred species of haws growing in the United States. It is extremely difficult to distinguish between the species. This short tree, with thin, erect branching and a narrow, open crown, prefers the banks of streams and open hillsides. The small leaves are narrowed or tapered at the base. The tips are round pointed and coarsely toothed, and the base is nearly smooth. The slender twigs are at first orange-green and smooth, later becoming bright chestnut brown and shiny. The older branches are ashy or reddish gray, with slightly curved spines of chestnut brown color, 3/4 to 1-1/2 inches long. The fruit occurs in few-fruited, small drooping clusters. It is dark red or rusty orange in color with occasional dark dots and two or three seeds. On the trunk the bark is gray to dark gray-brown and breaks into narrow, flat ridges. There are about 800 species of hawthorn in North America, of which more than 150 grow to tree size. Hawthorns are generally small, shrubby, thorn-bearing trees. Great individual variations complicated by frequent hybridization make accurate identification extremely difficult except for the professional botanist. Even botanists have not been able to agree on the total number of species found in North America. For these reasons no attempt is made here to differentiate between the many species of Crataegus. Hawthorns are often found in pasture land, where their sharp thorns protect them from grazing cattle. Because of this they frequently are able to take possession of abandoned lands until shaded out by forest trees in succession. Although the wood is of no commercial importance, many hawthorns are valued for ornamental plantings. The fruit, referred to as "haws,"remain on the tree all winter, providing food for wildlife.